Do you know what puts a damper on a beautiful smile? Missing teeth. Would you happen to know what kills a person’s confidence? Missing teeth. There should never be a reason why you wouldn’t want to show off your smile. Heck, you burn calories just smiling for crying out loud. Your smile is your personality and everything that you throw out there. Smiling can be just as contagious as laughing, if not more. If you’re missing teeth, there’s no need to fret. The dental industry has come a very long way in providing comfortable (and affordable) treatment for people who have suffered from missing teeth. At the office of Dr. Gary Rosenfeld, we know a thing or two about dental bridges, and the welcomed treatment they can provide patients. If you’re in the East Islip, NY and surrounding areas and want to rid yourself of the embarassment of missing teeth, then consider a dental bridge. 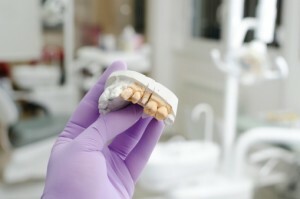 A dental bridge literally bridges the gap left over from a missing tooth or teeth. When you look at a dental bridge, you’ll notice it consists of two crowns (abutment teeth) that are anchored on each side, and a false tooth or teeth fills out the rest. Bridges come in all shapes, sizes and materials. It’s not surprising to see gold, alloy, or porcelain bridges. In fact, it’s quite common. As you can clearly see, a dental bridge is highly beneficial for your oral health. We know what you’re thinking, “Sounds great, but how long do they last?” You’re about to find out. Much like a bridge in real life, dental bridges can last you a lifetime, but it’s not rare for them to become loose or completely fall out. The best way to ensure your bridge stays as healthy as you do is to do something that’s really easy: practice good oral hygiene skills. One of the very few ways a bridge can become loose or experience deteriorating support is via dental disease. Keep those gums healthy and your teeth squeaky clean by brushing and flossing twice a day. It also helps coming to see us for regular check-ups and cleanings. Our East Islip, NY office is ready to give your mouth the support it needs. We will work with you to achieve the best oral health possible. We proudly serve all of Long Island and the five boroughs. Complete comfort can be yours — look into dental bridge treatment!